You must try this delicious Bengali Aloo Dum Recipe where the potatoes that are simmered in spicy tomato onion garlic and a yogurt gravy. Serve along with Luchi and Begun Bhaja for a weekend lunch or dinner. 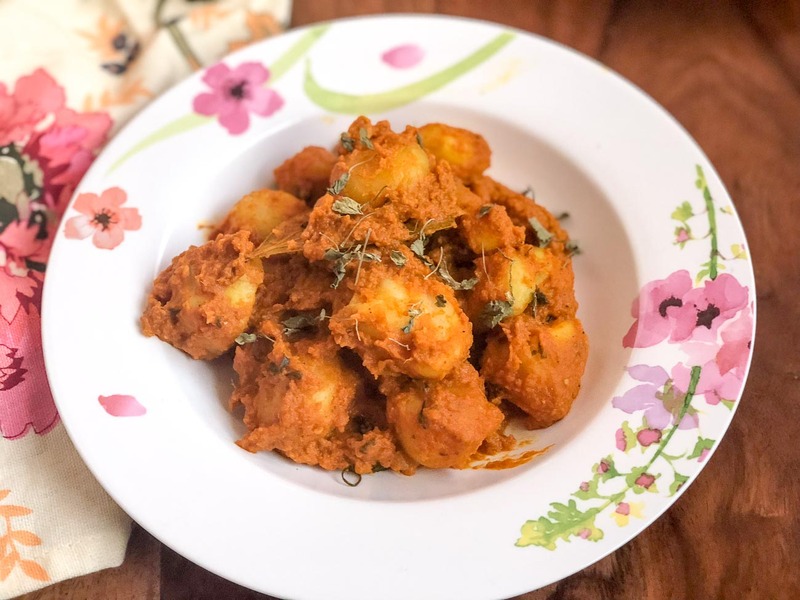 The Bengali Aloo Dum Recipe is a delicious recipe of potatoes that are simmered in spicy tomato onion garlic and a yogurt gravy. The potato is simmered in the dum aloo masala for a good 30 minutes until all the flavors are absorbed. Aloo Dum also known as Dum Aloo is a delicious spicy and tangy recipe that is a favorite at home. Dum is a process of slow cooking on low heat where we cook the rice or vegetables in its gravy and spices in a sealed vessel simmered for a long period of time. 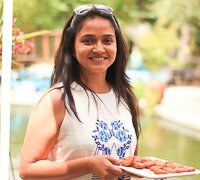 Serve Bengali Aloo Dum along with Bengali Luchi, Cholar Dal and Lauki Raita for a delicious meal with your family. To begin making Bengali Aloo Dum Recipe, add the onions, ginger, green chillies and garlic into the blender and grind into a smooth paste. Transfer the onion paste to a bowl and keep aside. In our next step we will be pan roasting the potatoes. For this heat 2 tablespoons of oil in a frying pan, add the boiled potatoes, a pinch of turmeric powder, and salt. Saute the potatoes till they are light golden brown in color. This process of roasting the potatoes gives a added flavor to the dish making it healthier and skipped the traditional process of deep frying them in oil. Once golden brown and lightly crisp transfer the potatoes to a bowl and keep aside. In the same frying pan, add 2 tablespoons of oil. Add in the onion, ginger and garlic paste. Saute the onions mixture on low heat until the paste turns golden and the raw smell goes away. This process takes a good 5 minutes. And yes , don't worry about the grains from the potatoes stuck on the pan, it will all get absorbed and cleaned up when we cook it along with the masala. After about 5 minutes of sauteing the onion paste we will add an inch piece of cinnamon, a few cardamom, a few cloves and a large bay leaf. Stir to combine the spices and roast them along with the onions for a couple of more minutes until your smell the aromas. Once you get a roasted aroma from the spices, add in pureed tomatoes, a teaspoon of turmeric powder, a teaspoon of coriander powder and and a teaspoon of garam masala powder. Stir the ingredients until they are well combined into the onions paste. You can also add a teaspoon of chilli powder if you like it more spicy. When the spices are well combined with the onion mixture, add in about half a cup of yogurt and stir again and mix well. Next add in the potatoes and a teaspoon of sugar. Check the salt levels and add a little salt if required. Cover the pan and we will now simmer the potatoes on low heat for about 20 minutes. Make sure you stir the Aloo Dum masala occasionally once or twice in between. Once you notice that the Aloo Dum Masala has thickened and has coated well onto the potatoes it indicates that the dum aloo is ready. At this stage turn off the heat. Transfer the Bengali Aloo Dum into a serving dish. Stir the coriander leaves well into the aloo dum. It gives added flavor and freshness to the dum aloo.